The Detroit postal district is kicking off a district-wide campaign to raise public awareness to prevent dog attacks. (WXYZ) — The Detroit postal district is kicking off a district-wide campaign to raise public awareness to prevent dog attacks. The postal service says that in 2018, 5,714 postal employees were victimized by dogs. When a dog attacks a letter carrier, USPS says the dog owner could be held liable for all medical expenses, repayment of lost work hours, replacement of the uniform and other costs, which can run into thousands of dollars. "That's why we're delivering this important message to the community," said District Manager Karlett Gilbert in a release. "Several of our letter carriers know first-hand about both the prevention and the pain of animal attacks, and we want to do whatever we can to help educate the community - especially parents and pet owners." 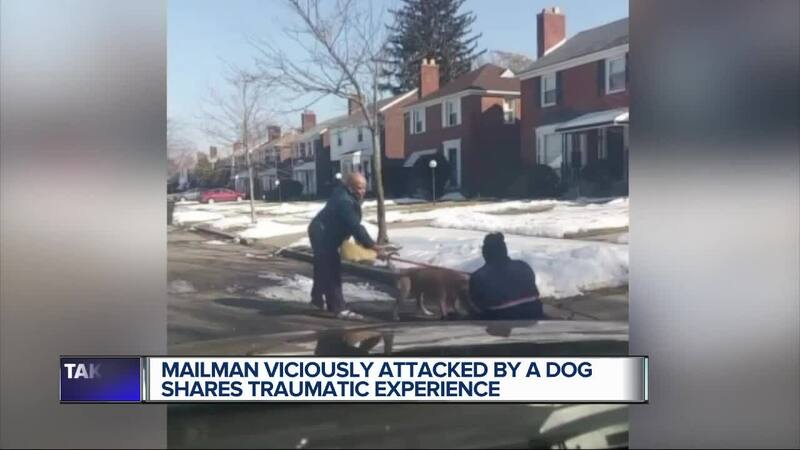 In February, a video showed a dog viciously attacking a mailman on a street in Detroit. The mailman was bleeding from his hand and has his knee banged up. Several witnesses tried to get the dog off the man. The owner of the dog said she never had any issues with her dog in the past. Tracking: Dog owners who have access to postal notification features for letter mail and package tracking are urged to use these features to determine when the carrier is on their way and to ensure their dog has been properly restrained. Expecting a postal package delivery on Sunday? Postal officials urge dog owners to restrain their animals on Sundays as well, as more residences now receive deliveries throughout the weekend.